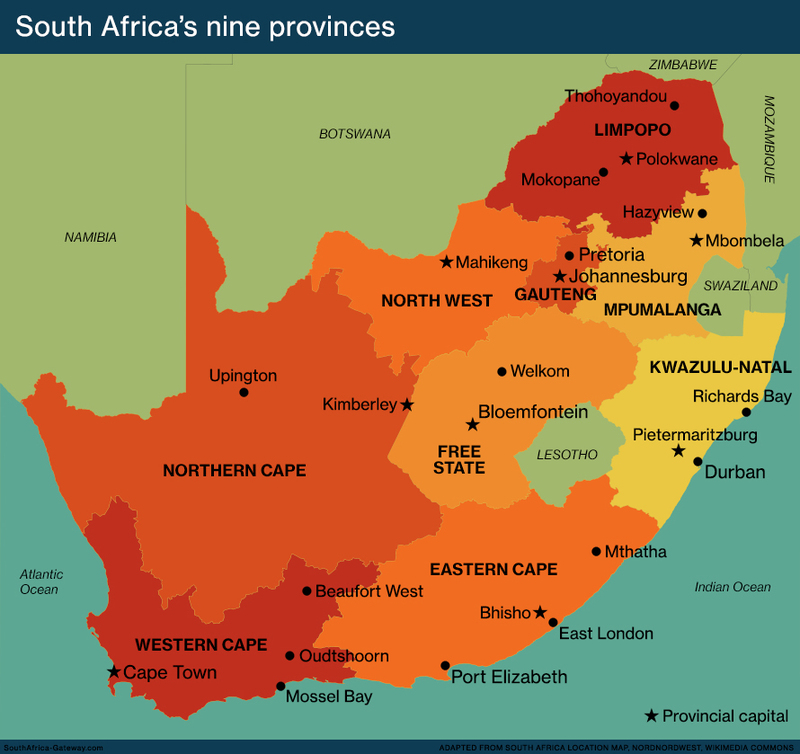 Before South Africa became a democracy in 1994 and established its new constitution in 1996, the country was divided into four provinces set aside for white people, and 10 “homelands”, small unsustainable states designated for black people. The old provinces were the Cape and Natal, former British colonies, and the Transvaal and Orange Free State, once Boer (or Afrikaner) republics. At the end of the Second Anglo-Boer War of 1899 to 1902 (more accurately known as the South African War because all groups were, in one way or another, involved in the conflict), Britain controlled all four territories. These were combined into the Union of South Africa, a dominion of the British Empire, in 1910. In 1961, following a whites-only referendum, the country left the British Commonwealth and became the Republic of South Africa. 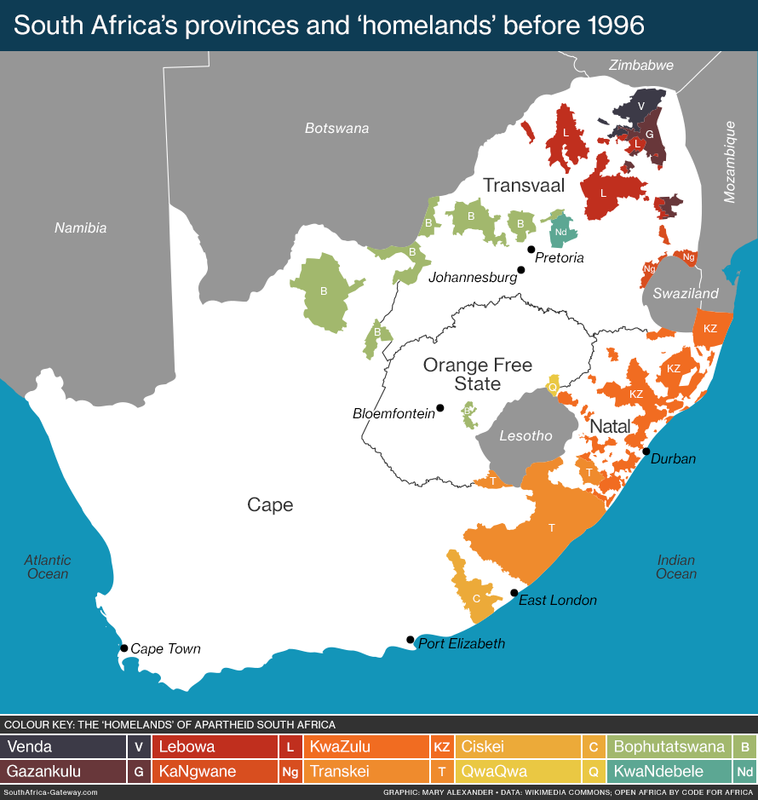 In 1996, following the country’s first democratic elections in 1994, South Africa’s new constitution dismantled the “homelands” and established nine new provinces in place of the old four. Natal and the Orange Free State remained the same territories, but were renamed KwaZulu-Natal and the Free State. The Cape became the Northern Cape, Eastern Cape, Western Cape and the western part of North West. The Transvaal became Gauteng, Limpopo, Mpumalanga and the eastern part of North West. The African “homelands” – also known as Bantustans – were established as part of the grand apartheid strategy of “separate development”. The idea was to establish states to which black South Africans were forced to have citizenship, thereby denying them citizenship of – and rights in – South Africa as a whole. These spurious states were not recognised by the rest of the world. They were set up on scattered parcels of uneconomic land, often with tracts of “South Africa” between them. This meant that cheap black migrant labour would always be available to profit the white economy, as the jobs were only in the areas set aside for white people. There were 10 homelands, each established for a specific “tribe” or ethic group. The notion of this ethnicity, these “tribes”, was the apartheid government’s racist simplification of complex linguistic and cultural groups. Tribalism was used to argue that apartheid was simply filling the needs of nationalism – KwaZulu for the Zulu nation, Transkei for the Xhosa nation, Bophutatswana for the Tswana nation and so on, while the rest of South Africa was for the white nation (whatever that is). In 1970 the Bantu Homelands Citizenship Act was passed, which made black people living throughout South Africa legal citizens in a specific homeland, according to the ethnicity set down for them in the population register. While the plan was for all 10 homelands to eventually become “independent” (again, an independence not recognised by the rest of the world), only four ever did: the Transkei in 1976, Bophuthatswana in 1977, Venda in 1979, and Ciskei in 1981. The graphics on this page are licensed under a Creative Commons Attribution 4.0 International Licence.